First of all, the iGloo model FRW1225 12 bottle wine cooler is very well designed. The stylish curved glass door on this wine cooler will look classy in almost any home. 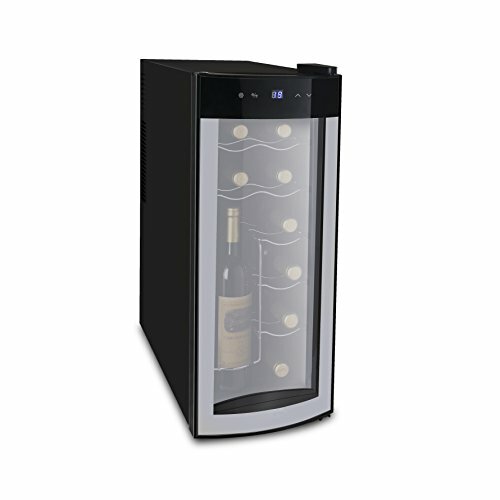 The glass door gives this wine cooler a upscale look, yet remains at a very reasonable price point. We found this wine cooler to operate quietly. Unless your house is dead silent, you will not be able to hear this wine cooler running. Also, the blue LED interior light is an added benefit. The light automatically comes on when the wine cooler door is opened. In addition, the electronic temperature controller ranges from 46-64. We recommend using a higher setting, perhaps 60-64, when storing only red wine. Set the wine cooler to the lowest setting of 46 for the optimal white wine temperature. Yet, you may also use the lowest setting for a mixture of red and white wines. The perfect wine temperature can vary due to personal preferences. As a result, we recommend experimenting with the settings to find the perfect temperature setting. Limited on space? Especially relevant, this compact wine cooler requires minimal space coming in at only 10 inches wide x 25.25 inches tall x 20.2 inches deep. Due to these dimensions, any home should have the perfect spot to house this small of a wine refrigerator. Ice bucket is perfect for serving up mixed drinks with efficiency and ease. Holds approximately 3 quarts of ice. Stainless steel scoops conveniently stores in attached holder. Insulated ice bucket with lid keeps contents cold; measures 9 T x 8 D.
Featuring thick insulated walls. Crafted from stainless steel. Comes with round handles on each side and another on the lid. Measures 9'' x 8'', with a 5'' base. Overall, we find the iGloo FRW1225 to be an excellent option for a small wine cooler. Most noteworthy, it will be tough to find a better wine cooler for the money. 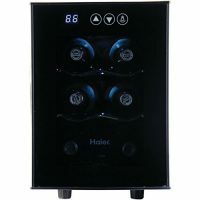 This is an excellent wine cooler for the person only wanting to keep 12 or less bottles chilled.